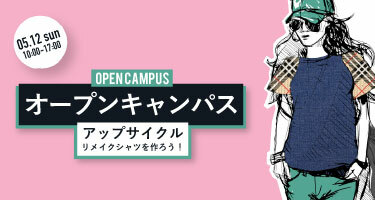 Open Campus on May 12 is about “Up-Cycle”. During the class, you can try to design and create your special original REMAKE shirts. Do you know the difference between Recycle, Reuse and Upcycle? It is said that Recycle is to regenerate by changing materials itself like molding or crushing. For example plastic bottle changes to fleece materials. Reuse is to regenerate by not changing material like washing empty bottle or giving someone clothes you do not wear anymore. Upcycle, very popular termination among fashion industry is to revive materials by not changing itself but putting more value by design. For example famous FREITAG is an upcycle brand. Established in 1993 by FREITAG brothers. FREITAG starts from water repellent messenger bag made with sail and sheet belt. People like this bag not only because its durability but each bag is cut by different part of sail. Do you have any clothes in your closet you do not wear anymore? Bring those clothes and make your special REMAKE shirts using parts from your clothes and our fabric with our teacher from Stylism(design). Stylism teacher at ESMOD Tokyo. Worked as a pattern maker at Missimo Monte Forte in Italy after working as a pattern maker at Yohji Yamamoto. We will move on to actually create shirts based on your design. Even if it is your first time using sewing machine for the 1st time, do not worry about it. Our Teachers and Student will help you to finish your work. Modelism teacher at ESMOD Tokyo. Graduated from Japan Womens University and Hosono Fashion School. Studied under Mr.Hosono, a Haute Couture designer. After working at several « prêt-à-porter » companies as a chief patterner, became a freelance patterner working at Tokyo collection.